← When to Hire What for Your Wedding? The month you choose for your wedding has a big impact on your choice of venues. Choosing when to get married depends on many things, of course. How long do you plan to be engaged before tying the knot? How long will it take you to complete all of the planning for your event? Are you planning a simple ceremony in a small chapel, community center or even someone’s home, or are you planning a lavish affair at a local or exotic venue? These are only a few of the questions you’ll want to ask yourself. The chart at the left shows the percentages for each month of the year in terms of its popularity for holding a wedding. 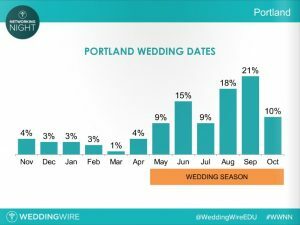 As you can see, the “Wedding Season” begins to ramp up as early as May here in the Portland/Vancouver area, increases in June (the “typical month” for weddings in the U.S.), dips in July and then peaks in August and September before beginning a steep decline in October. You’ll have more venue choices, and more day and date choices, during the “off-season” months. You’ll probably want to avoid outdoor venues during the late Fall, Winter, and early Spring months due to the weather. You’ll need to book earlier rather than later if you want a rented venue during the wedding season months. If you are extremely budget conscious, you may find lower prices during the off-season months. And more venues and service providers to choose from. If people are going to be traveling from far away for your ceremony you’ll probably want to avoid the months where inclement weather could likely disrupt travel plans and schedules. These are only some of the things to consider, of course, in choosing your wedding date. As a point of reference, I’ve included another chart in this post, again courtesy of WeddingWire.com (where I am a registered vendor and where there are several client reviews). 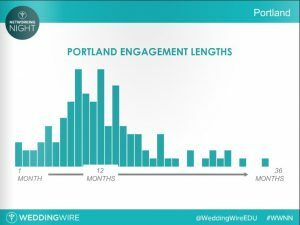 It shows the average length of engagements, without regard to any chosen ceremony dates, for engaged couples in our area. You can decide how long you wish to be engaged before marrying, which will dictate the month in which you will plan to marry. You can decide when you’d like to be married, which will dictate the length of your engagement. Let’s say that you decide to become engaged in December and that you want to be engaged for twelve months. That means that the earliest you’ll want your ceremony will be the following December. Does that fit with the kind of wedding venue and ceremony location you’d like? If not, you might want to rethink your engagement length options. Alternatively, let’s say that you want to get married in August at a venue that supports an outdoor ceremony. Will that work if you want to be engaged for a minimum of twelve months from December? Nope! If the date of the ceremony dictates the engagement length, the engagement length has to be twenty months! I hope this example helps you think through some of the early decisions you’ll need to make. I’d love to have your comments and reactions to this post. Don’t be shy– comment now! Thanks for reading and please share this post with others who you think may be interested in the topic.